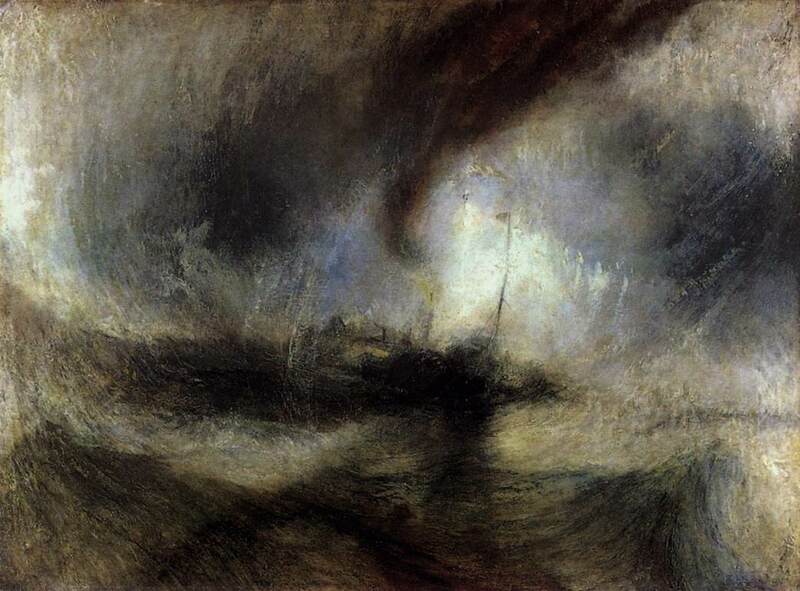 Turner has been one of my favorite artists since we had a book of his works in our long-ago bookshop. Then a nearby gallery actually had one of his smaller paintings on display, and seeing it was breathtaking. I saw a Turner exhibit in London a number of years ago and was surprised at how many large traditional paintings he did. I was hoping to see his impressionist paintings (way before their time! ), which is mostly what I had seen before…and loved. I can’t recall if there were any of those or not–it was a long time ago. Fascinating and very informative! I learned so much more in the short podcast than I had watching the movie or even from art history class (only touched a bit on Turner)! Thank you!!! Until concurring where it would live. Consumed, the cusp of time birthing the world, violent, brilliant, unrelenting. The coagulating clouds thicken like Dragon’s Blood. All of blazed creation, a haunting. To a rising–rising citron aria, mocking the last fatal moments of the lawless nightmare below. Thanks for the interview – I learned so much about one of my favorite artists. I plan to order the book. Franny Moyle. In the conversation it was so easy to visualize the various aspects of Turner’s life. Franny total fascination of this artist’s life is very delightfull. Her expressive voice really captured all the various aspects of Turners artistic development. It’s one thing to be familiar with his work and quite another to learn about his life. The images of Turner’s work shown after the interview completed this surprise podcast with total appreciation. I am definitely adding this book to my large collection of art books. this was a wonderful podcast and interview. It was so good to hear about all the changes that occurred in England at this time and to have them in context was especially good. Turner occupies a spot in the “backroom” with my other influential artists. “Varnishing Day” ritual on its head. THe Academy couldn’t uninvite him and his canvasses remained unvarnished! The Author is very generous and amazing in the interview. You feel the admiration she as for Turner as she transmitted to people. One sentence strikes me; “He did what he wanted”, no matter what was surrounded him Academy wise or from artists at the time. This was a wonderful interview; thank you Jason. Always a huge Turner fan, the film I saw a few years back, although visually stunning in places, was a massive disappointment to me; so I’m very happy to hear Franny Moyle’s comments about the artist and his life. Sounds like a good read; will check it out. In 2016 we visited the London museum to which he willed his paintings. We had seen a movie about his life, then bought a small book that confirms most of the movie details. Therefore we were prepared in advance to look at all of the collection. By knowing so much about the man, we were able to understand his work as it changed with the passing years. I don’t know if the book we have is the one written by Ms. Moyle, if not, we will buy her book too. Turner was a fascinating person and while his work is often overlooked in the US, in England he is famous and always will be.